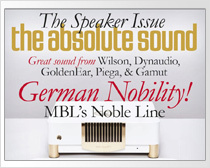 The October issue of The Absolute Sound Magazine published an article about MBLs new designed Noble Line. “German Nobility! MBLs Noble Line“ is the headline of Jonathan Valins review. Find out more about the subtleties, refinements and the hard facts of the with great care engineered electronics.